What is Nutramax Welactin Omega 3 Feline? 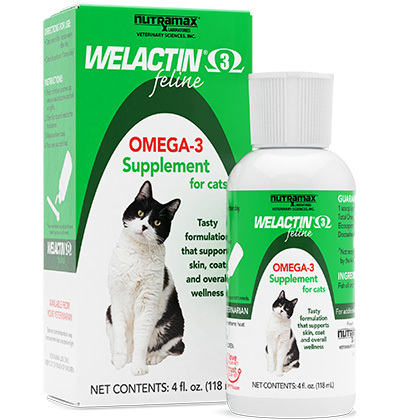 Nutramax Welactin Omega 3 Feline is a high-potency fish oil supplement rich in omega-3 fatty acids, EPA (eicosapentaenoic acid) and DHA (docosahexaenoic acid) derived from cold water fish. 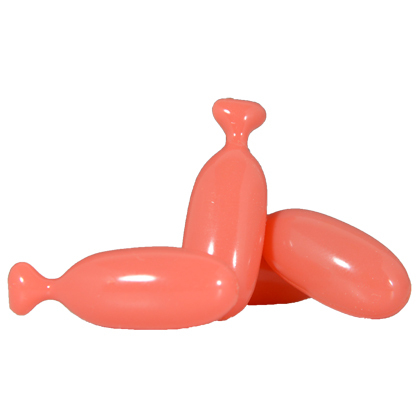 Available as liquid or softgel caps, this tasty formulation is easy to administer because cats love the taste. Nutramax Welactin Omega 3 Feline supports skin and coat health, renal function, brain health, vision, and nervous system function. Support your cat's overall wellness with Nutramax Welactin Omega 3 Feline. NOTE: Nutramax Welactin Omega 3 Canine Liquid and Softgel Caps are also available for dogs. How does Nutramax Welactin Omega 3 Feline work? Nutramax Welactin Omega 3 Feline Liquid and Softgel Caps contain cold water fish oil high in omega-3 fatty acids. Omega-3 fatty acids are known to support overall good health in pets, including skin and coat health, renal function, and nervous system function. Nutramax Welactin Omega 3 Feline is a rich source of omega-3 fatty acids derived from cold water fish. 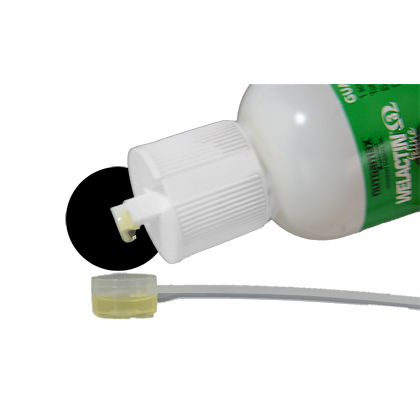 To use Nutramax Welactin Omega 3 Feline Liquid - prior to first use, unscrew the cap, remove the seal and screw the cap back on tightly. Open the flip top and invert the bottle to dispense. Use the accompanying scoop to measure the appropriate volume of Nutramax Welactin Omega 3 Liquid and pour it over your cat's food. To use Nutramax Welactin Omega 3 Feline Softgel Caps -Twist or clip the end of the capsule to open and squeeze the contents directly onto your cat's food.Do not feed gelatin capsule to your cat. While using Nutramax Welactin Omega 3, look for a response in your pet's general appearance, activity level, attitude, appetite, and alertness. Give contents of one softgel capsule daily or as directed by your veterinarian. Feed contents only; do not feed gelatin capsule to your cat. Twist or clip the end of the capsule to open and squeeze the contents directly onto your cat's food. Ingredients: Fish oil and mixed tocopherols (a preservative). Softgel Capsules Contain: Gelatin, zinc oxide, glycerin, annatto extract color, and carmine color.